Taking care of a vehicle should be a top priority for any car owner. However, it can be difficult at times due to the busy nature of our day-to-day lives. Failing to perform routine maintenance on your vehicle can lead to major car problems down the road. That’s why the car maintenance checklist was created by Microsoft. With the car maintenance checklist, you can give your car the attention and car it needs and deserves. Repairing and maintaining a vehicle can get costly. That’s why the car maintenance checklist from Microsoft is available for free. You can download, save and print the car maintenance checklist instantly by clicking the link available on this page. 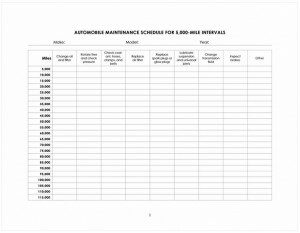 The car maintenance checklist is a printable Word document created by Microsoft. The template is customizable, meaning the formatted items can be changed to better meet your needs or those of your car. The top of the car maintenance checklist is reserved for the car’s make, model and year. The checklist is designed for 5,000-mile intervals, meaning routine maintenance tasks should be performed every time your vehicle reaches this milestone. Once a task has been completed, simply mark it off in the corresponding box on the car maintenance checklist. Not every task will need to be completed every 5,000 miles. Before beginning any task, it’s best to consult with your vehicle’s manual or a licensed mechanic. Keep your car running in top shape with the car maintenance checklist from Microsoft. Download the car maintenance checklist for free today!